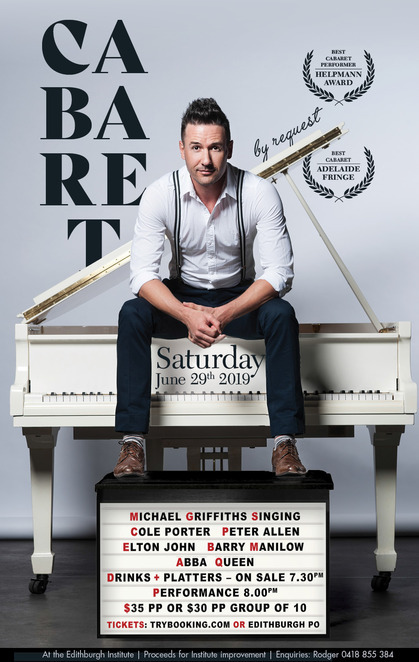 Following the sold-out success of the 2019 Adelaide Fringe season, Michael Griffiths: By Request comes to the heritage Edithburgh Institute for one night only on 29 June 2019. Tickets are now on sale. Helpmann Award winner Michael Griffiths is one of Australia's finest performers. His one-man cabaret shows In Vogue: Songs By Madonna, Sweet Dreams: Songs By Annie Lennox, Adolescent and Cole have received critical acclaim and delighted audiences across every cabaret festival in Australia and beyond, including New York, Los Angeles, San Francisco, London, Edinburgh, Hong Kong, Christchurch and Auckland. Griffiths' latest show 'By Request' celebrates his remarkable two-decade career and sees the performer remove the mask and perform an eclectic range of handpicked songs by the likes of Peter Allen, Elton John, Barry Manilow, ABBA, Queen and many more. Griffiths will be backed by a two-piece band and share interesting anecdotes about his favourite songs and career on and off stage. Tickets for Michael Griffiths: By Request are now on sale through Trybooking or at the Edithburgh Post Office. Early bookings are advised. Follow Facebook, Twitter and Instagram for all the latest.